On occasion, a request to a Remote System Monitor will encounter an error. For example, checking in a file for compile will result in a failure if the file is locked for use on the Master. At any time during the job processing, the user can review the state of the job and see all of the messages returned by the Remote System Monitor. Each job is split into three main areas (if appropriate): Check in/out definitions, RDML Compiles and RDMLX Compiles. The messages are shown in the appropriate area. As each part of the job is completed, the area of the job will show as complete. Once all areas are complete, the job is deemed complete. All compiles on a Remote System will produce a job log. You can see the job log in the Visual LANSA Editor. 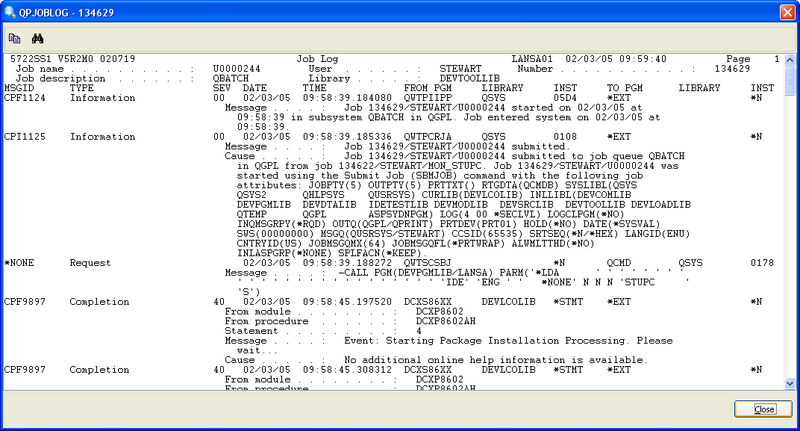 Where a message relates specifically to processing done on the Remote System, the entry is shown with an icon to indicate that a job log is available.